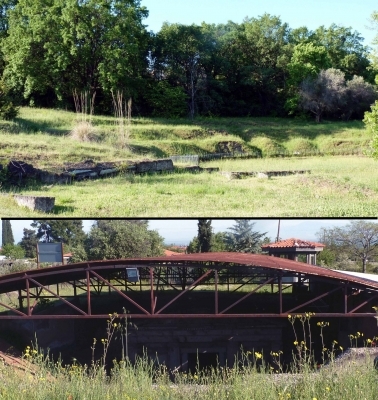 The Archaeological Site of Aigai (modern name Vergina) became famous in 1977, when the tomb of Alexander the Great's father, King Philip of Macedon, was discovered there. 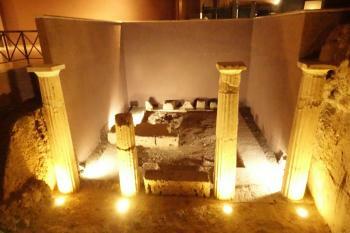 This proved undoubtedly that Vergina was ancient Macedonia's first capital, Aegae. Aegae was inhabited from the early Iron Age (1000-700 BC) onwards. It was the capital of the Macedonian state until King Archelaus transferred his seat to Pella. However, also then it remained customary for Macedonia's kings to be buried in the original capital. Aegae flourished chiefly in the second half of the 4th century B.C. To this period belong the Palace, Theatre and the Tombs. In 168 B.C. the city was seized by the Romans and burnt down. Vergina is situated near Veroia, some 75 kilometers east of Thessaloniki. The easiest way to get there is by car. Not for the first time in my world heritage hunting-life, I had some trouble to find the site. It actually is very easy: the tumulus is like a small hill in the center of the town, with lots of souvenirshops nearby. The palace and the theatre are about 2 kilometers uphill. The burial mound doesn't look inspiring from the outside, but when you go down inside you enter a magic scene. The place has a diameter of 110 meters, and is 12 meters high. Currently there is a fascinating combination to be seen of on site remains (tombs, columns) and museumpieces taken from the site. A lot of sublime silverware was found (enough to equip a huge kitchen), but the golden crowns made of leaves are my favourite items. The palace is just outside town, and more like a classic Greek sight. Unfortunately the supposedly great mosaics were under cover during my visit. However, this area and the theatre below are worth strolling around. We visited Aigai in April 2018 and, in common with previous reviewers, concentrated on the “Royal Tombs Museum” in the “Great Tumulus”. It is truly magnificent, both in concept and in contents. A tumulus, which was successively extended by the Macedonians to include 4 different tombs, has been “hollowed out” during and after excavation (which only commenced in 1976), and then roofed over to create a large interior space whilst maintaining its exterior size and covering of grass. 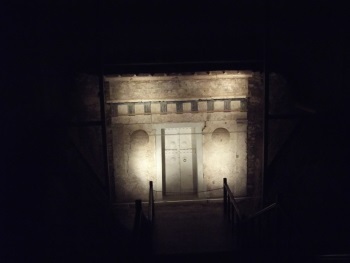 Within this space each tomb is accessible in its original location (though unfortunately not their interiors, for which one has to rely on replicas - though the original exterior paintings are visible). Their vast collections of funerary objects have been laid out in display cases adjacent to each tomb and include many items which are fully “up there” in their artistic and historical value in comparison with other famous “tomb finds” from around the World. One thing which does seem to have changed since the earlier reviews is what appears to be a far more strict enforcement of a “no photos” policy - I was verbally “warned” on entering that photos were not allowed and that there was CCTV “watching us”. There were plenty of notices around but the guards no doubt regard "old codgers" with cameras around their necks as spelling potential trouble! There was also a full complement of guards located around the tomb museum and I saw no-one surreptitiously using their mobile. Hence – no interior photo from me! But there really should be a lot more to see at Aigai than just this single tumulus of royal tombs. Nan describes below how, in Apr 2017, he ventured up to the “Palace Area” to get a “bit more” out of his visit but found it closed. We did the same with much the same result. I did, however, walk around the fence to make out the remains of the Theatre where, in 336BC, Philip II of Macedonia was assassinated and his 20 year old son “Alexander” was proclaimed “king”. There is little really to see at the theatre (photo 1) but those who adhere to the “Cleopatra’s Nose Theory of History”, might enjoy considering the subsequent historical impact of the “chance” event which took place there! In just 10 further years Alexander conquered the rest of “Greece” and lands from Egypt, through Anatolia to Persia reaching as far as Taxila in “India”, with results which completely altered the trajectory of World history. The entire Palace area has been closed for restoration for some years and lacks the “bling” and fame of the Royal tombs but shouldn’t be regarded as being of less importance. Wiki comments “The palace is considered to be not only the biggest but, together with the Parthenon, the most significant building of classical Greece” whilst the AB evaluation says “The most important building so far discovered is the monumental palace, located on a plateau directly below the acropolis. This building, which rose to two and perhaps three storeys, is centred on a large open courtyard flanked by stone Doric colonnades. …... On the north side was a large gallery that commanded the stage of the neighbouring theatre and the whole Macedonian plain. lt was sumptuously decorated, with mosaic floors, painted plastered walls, and fine relief tiles.” We really regret not having been able to visit it! The owner of our B+B in Aigai had grumbled that the town didn’t attract enough overnight visitors because the main tomb alone could easily be taken in on a return day trip from Thessaloniki. However, she held out great hopes for the re-opening of the Palace area and the construction of a new museum there which would attract people to stay for longer. Yes, Greece apparently has enough money to build yet another museum at Aigai (I suppose that, if you regard “Tourism” as one of Greece’s major “industries” then such investments which, in other countries, might be considered to belong to the “nice to have if you can afford it” category, are fully justified). Now, today 8 June 2018, I have received a “Web feed” telling me that the “Palace Site” was officially (re)opened 1 day ago! This article from Feb, correctly forecasting the opening in May, gives a better impression of what has been done - note the Theatre at bottom left of the site. Finally this “propaganda” video from the EU and Greek Government shows the size of the project and what a good job they have been doing! And what of the Museum? The above article refers to it as still being “under construction” and due to open in 2020 (with “completion” of the Palace reconstruction itself a further 2 years away), but the Web in general contains surprisingly little about it (I would have expected at least a “puff” from the architectural practice which had designed it!). It appears that it is to form a part of Aigai’s “Polycentric Museum” (the clue lies in the “Greek”!!!). As far as I can make out, this is to consist of several “museums” covering a number of the different locations at Aigai (including the existing “Royal Burial Cluster” in the Great Tumulus) with its “gateway” building at the Palace itself and indeed incorporating a part of it. This link provides an introduction (with its proposed different elements accessible from the “white box list” on the LHS). There “a new building ….will house a permanent semi-open-air exhibition of the sculptures found in the city sanctuaries and will accommodate the restored upper floor of the Palace’s façade”. It is described here in outline (It now appears to have become a "Multi-focal" museum - I am not quite sure whether this is intended to be "different" from "Poly-centric" - other than in using words with a Latin rather than a Greek root!) Note the previously planned completion date of Jan 2018 and the source of the majority of the funds from the ERDF! Hopefully all this effort/cost will allow the mosaics to be better viewed than when Els found them “under cover” back in Nov 2003. So, if one can now visit both the Great Tumulus AND the Palace/Theatre area, what about other inscribed areas? On the way up to the Palace you will pass, on the LHS, one which is signposted “Queen’s tombs”. There is a gate and what might be a ticket/guard office, as well as some old information boards which imply that it was once “open” for viewing - but now the site was completely closed/locked up and looked to have been so for some years! However, further up the hill past the strong fence, you can climb up into a field and reach the site from the rear where you will see a series of excavations covered by tin roofing sheets. Under some of these can be made out a portico reminiscent of those of the tombs in the Great Tumulus (photo 2). This is perhaps not really worth going “out of your way” to see, but of interest to show the wider range of tombs etc beyond the Grand Tumulus which are located at Aigai. I am not sure which tomb we were looking at – possibly that of Queen Eurydice, mother of Philip II? If so, a number of carvings from the queen’s throne inside that tomb were broken off and stolen during Aug 2001. An “inside job” and “lack of staff” were blamed. Perhaps this partly explains the “shut down” in the area (I presume that our “excursion” into the rear field was being observed on CCTV somewhere if we had tried to enter the site itself!) – but the rather “ramshackle” preservation of the archaeological area didn’t seem to bode that well for its future well-being. From the description of the elements planned for the ultimate vision of the Museum it would appear that there is no intention to include the Queens Tombs within its “polycentricity” but there are other elements which, as yet, no one on this Web site has visited/reviewed - e.g The Ancient City and Walls, “The royal burial cluster of the Temenid dynasty or burial cluster C’ and the Necropolis. Not to mention the Acropolis and the second WHS location at nearby Emathia! I look forward to future reviews which take in these and the renovated Palace/Theatre area together with its new museum! At the time of my visit (April 2017) only the royal tombs museum is open and can be visited. As previous reviewers have pointed out the combination of excavation site with actual graves plus the artifacts found on site and all of that hosted within the original hill is unique. Still, it’s a fairly quick visit. And personally, having a bit more lightening would have helped; I found the rooms way too dark without a reason. The palace area is currently under renovation. I climbed nonetheless to get a bit more out of my visit. From the little I could see from the outskirts heavy construction works are taking place. Don’t expect this to be open for the foreseeable future. A pity, if you ask me, as I am hard-pressed to see why you would have to lock up the whole area and could’t keep parts of the site open for viewing. The only part you can view is the theater area. The official website refers to frequent busses between Vergina and Veria. When I arrived in Veria around 2 p.m. the next bus was to run at 8 p.m. I ended up taking a cab back and forth (17€ and 15€). Taxis are frequent in Veria. In Vergina I had the gas station call a cab. Vergina is well connected by frequent busses (1h express, 1.5h normal) and far less frequent trains (1h) to Thessaloniki. The train station is outside town with cabs and a bus to the town centre waiting on arrival. The bus station is in the middle of town. If it fits your schedule, I would still counsel to take the train as the bus station in Thessaloniki is really far out and it will take you another 30min to get back into town. And the train is faster, even taking the average delays into account, and certainly cheaper. Finally, if you can go by car, the clear recommendation is to do that. The museum itself is rather small and covered in an hour. From there to Philip’s palace it’s a 20min walk uphill, the parking lot being in the middle. Not sure if Els updated the official website, but it is www.aigai.gr. Also, a new museum is being built; EU money needs to be spend. I travelled from Thessaloniki by bus to Veria, and changed there to a bus going to Vergina. Having just read Scott Oden's book 'Memnon', I was most interested to see the reconstructed tomb of Macedonian King Philip II within the museum. The museum in Vergina is by far my favorite. The set up is unlike anything I have ever seen before since the museum is literally underground. The dark atmosphere with spotlights of each exhibit gives the whole place an eerie, mystical feel, as if you were actually there in the time of Phillip II. I visited a lot of museums at different sites on that trip, and they are all relatively similar except for this one. I would highly recommend it to all, history aficionado or not, it is a great experience and you will learn a lot. An amazing world heritage site and highly recommended for those wanting to see the wealth of the Ancient Macedonians and how different their burials and artefacts are compared to Ancient Greeks to the south!! We visited this site in 2007. It was the most memorable museum I have ever enjoyed. The fact that it was built on the site and in the same design of the original discovery is amazing. The quality of the restoration of the artifacts was incredible. I especially remember the crown made of delicate gold foil and decorated with what looked like 3D acorns, flowers and leaves. I also appreciated the two burial temples inside the tumulus. If you are anywhere near, be sure to visit. I was a tour leader to Greece a couple of years ago. Visiting this museum in Vergina was absolutely one of the highlights of the trip for all of us. All artifacts were beautifully displayed, labeled in English, with explanations given to verify their authenticity. I was totally amazed at the craftsmanship and condition of the various items! I believe it is one of those places that most people have never heard of and I'm sure a huge percentage of the visitors to Greece miss it. 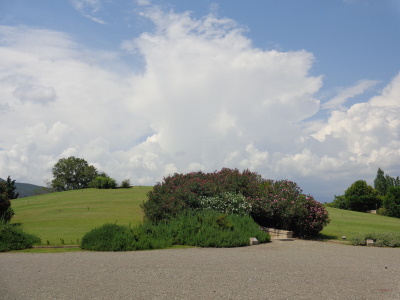 There are few accessible sites associated with Alexander the Great, his father Philip II, and ancient Macedonia in general, but Vergina is one of them and a very interesting one to boot. The focus of the site is the great museum that is cut into Philip´s tumulus. It´s one of the most interesting museums I´ve ever been to, and I wish I had had more time in Vergina to explore the area in closer detail. The roads in the vicinity of Vergina are scattered with tumuli, and there are probably lots of undiscovered treasures there. I also visited nearby Pella, which has some interesting mosaics and a nice museum, but doesn´t have anything like Vergina. From "Archaeological Site of Vergina" to "Archaeological Site of Aigai (modern name Vergina)"
Thracians: Meda of Odessos was a Thracian princess. She was buried at the Great Tumuli of Vergina, in a separate room.